A few of our favorite Meriwether’s pantry board choices. It only rained three times today! Each of those is a minor victory, and therefore an excuse to celebrate. That, and we were lucky enough to have a gift card for Meriwethers tucked in a drawer, yearning to be used. So use it we did on a recent Tuesday night. Meriwether’s is one of the first restaurants James and Zandra took us to before we moved to Portland, and since then it’s been the site of more than a couple of birthday celebrations. Something about this place feels like a special-occasion destination. The historic building once marked the entrance to the 1905 World’s Fair and retains an element of rusticity. Dark wood floors, huge stone fireplaces, log ceiling beams and grand windows add drama to the dining room’s elegant farmhouse feel. It’s the kind of place most people would feel comfortable bringing the parents or grandparents for a celebratory meal: well lit, workable noise level, attentive service. But, really, it’s the food that keeps us coming back. Meriwether’s, like many Portland restaurants, is a farm-to-fork kind of place, but with a twist: It operates its own farm, Skyline Farm, in Northwest Portland, and the menu changes frequently based on the week’s harvest. On more than one occasion, we’ve threatened to make a meal of the pantry-board section and this one was no different. Choose one, three or five items (better go for five — choosing is difficult) and share the glorious small bites. 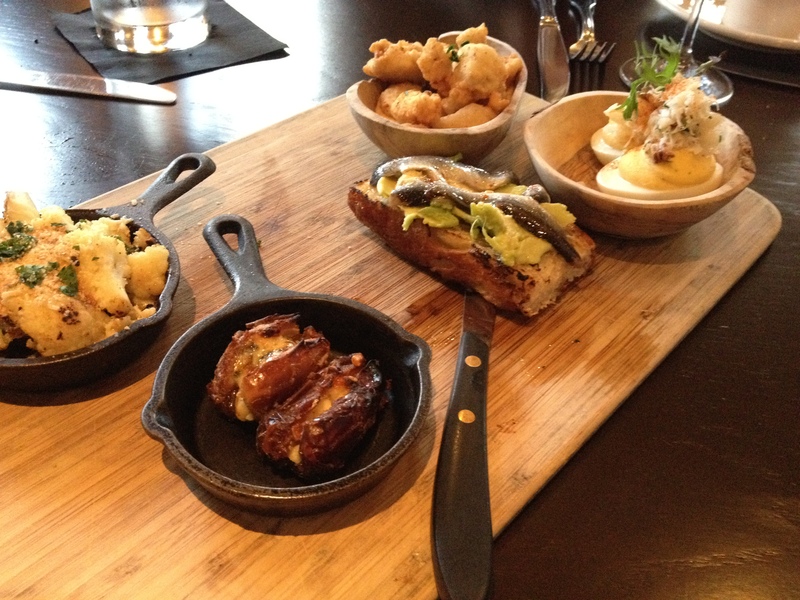 We had the Oregonzola-stuffed dates; light and crispy fried sweetbreads with a smoky chipotle aioli; crab deviled eggs; cauliflower gratin; and anchovy avocado toast. All were delicious, but of the five, the anchovy avocado toast stood out: avocado spread over toasted bread with two fillets of anchovy layered on top. Salty, creamy, two bites of bliss. Pizza with prosciutto and greens. Tempting as it is to order these delicious nibbles all night, we soldier on to the lower half of the menu. A selection of salads is next, followed by pasta and grains, all of which come in small or large sizes, conducive to mixing and matching, depending on your level of curiosity and hunger. Each of us ordered the farmhouse salad with fennel and shaved pecorino cheese: simple, lovely. For entrees, Zandra had a deliciously chewy papardelle with a meaty ragu — gorgeous. The night’s most-unexpected award went to J’s halibut entree served over Asian stir-fried vegetables with a bit of spice. (Stir fry? At Meriwether’s? Sure, why not.) James and I both selected from the bar menu. I had the bacon cheese burger with truffle salt fries. The burger was good, if not memorable. Leftover aioli from the sweetbreads made for tasty fry sauce. 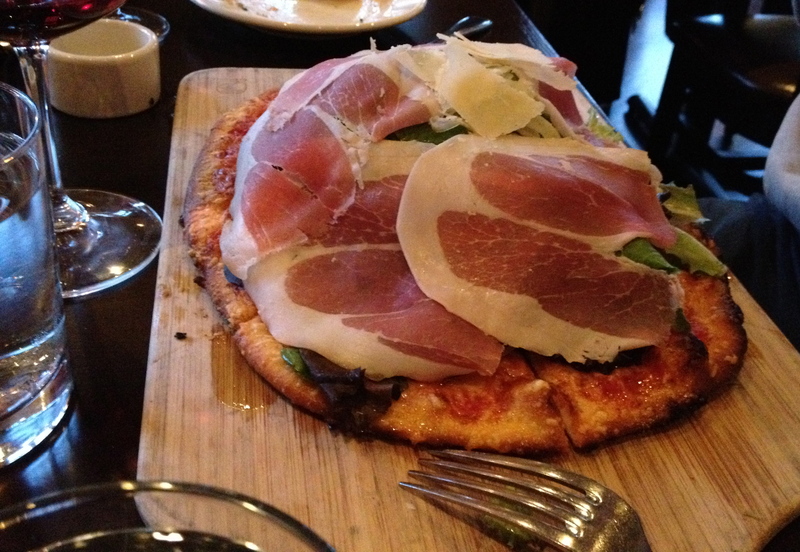 James ordered the pizza: a large, oblong flatbread mounded with arugula and prosciutto. With enough greens to satiate a hungry goat, it’s likely the least guilt-inducing pizza on earth, and a tasty one at that. Chalk it up to being a Tuesday night, or that the service on this particular evening was scattered, leaving us sitting longer than we’d planned, but we skipped dessert. No matter, there will always be the next time we have a reason to celebrate.